Click on play button to listen high quality(320 Kbps) mp3 of "[BTS] JIN (Cover)– I Love You (난 너를 사랑해) Sub Español (Hangul - Rom)". This audio song duration is 2:50 minutes. 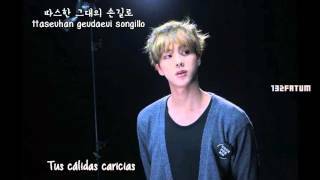 This song is sing by [BTS] JIN (Cover)– I Love You (난 너를 사랑해) Sub Español (Hangul. You can download [BTS] JIN (Cover)– I Love You (난 너를 사랑해) Sub Español (Hangul - Rom) high quality audio by clicking on "Download Mp3" button.